Born in Dublin, Ireland a few years ago(!). 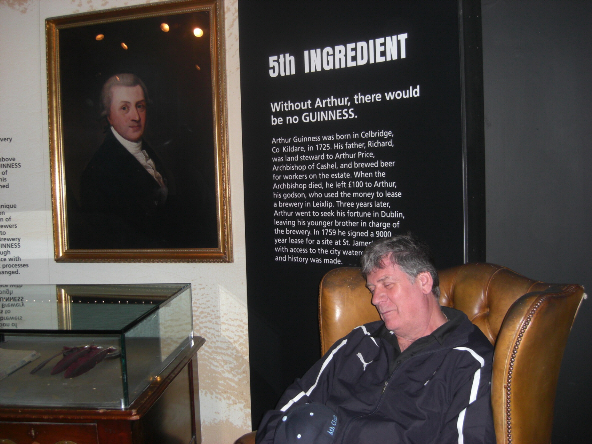 I think it was from about the age of 2 that I started to develop my love affair and fascination with Guinness – this love has never left me, indeed it has grown over the years but, it has left its mark on my once loved six-pack! 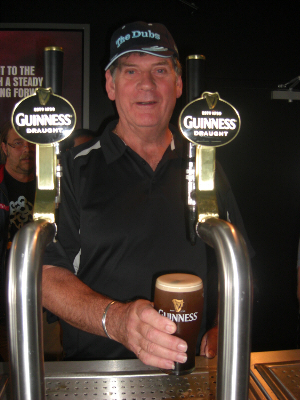 Next time you spot a Guinness tap have a look around and you just might see me. The other love of my life is making, customising and repairing drums. I started working at the Boosey and Hawkes factory in Edgware, Middlesex when I left school in 1958. I was an apprentice in the Drum Department making Ajax and Edgware drums and later Rogers drums (under licence). Moved to the Boosey and Hawkes retail shop in Denman Street, Piccadilly where I did repairs in the basement, along with three other men, doing on the spot repairs. This was mainly for musicians working in the theatres and clubs in the West End of London, as in those days, most theatres employed over twenty musicians. Later on I moved upstairs to the sales department selling drums. In 1971 I decided to start my own company. I worked at home for a while then was offered a workshop above Len Hunts drum shop in ArcherStreet, Piccadilly. I was doing repairs, refinishing and re-spraying etc. I made my first drum for Bob Henrit in 1973 he wanted a 10 by 7 tom-tom to match his kit which he could not get anywhere. The word spread and I started to get more and more orders then decided to design my unique shells and tooled up for my own design square lugs etc. The premises became too small at Archer Street and an opportunity arose to move to Covent Garden in premises measuring 6,500 sq. ft. (Great!!!) . I expanded my staff to a total of six people, I had a drum showroom there, a drum factory, drum studios providing drum tuition by Lloyd Ryan (no relation), rehearsal rooms used by many various bands of the day. 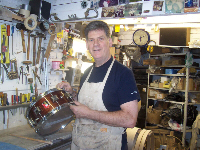 In 1987 I moved my workshop to Hornchuch in Essex where I still make, repair and refinish drums today. I am always happy to talk to old and new customers and discuss your requirements. After a hard day’s work!